"Ever wish you could get that restaurant-style rotisserie chicken at home? Well, with minimal preparation and about 5 hours' cooking time (great for the weekends!) you can! I don't bother to baste the bird, though some like to for the first hour. 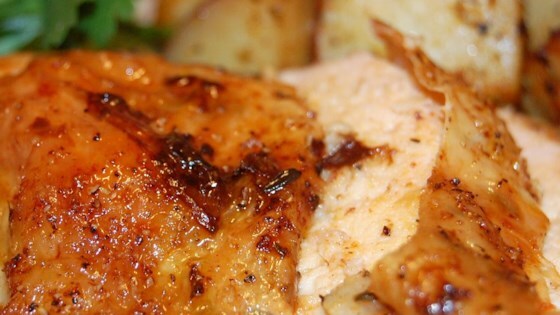 The pan juices always caramelize at the bottom, and the chicken will turn golden brown...fall-off-the-bone good!"